This was really cool video created by our friends over at DeMarco Films (http://www.demarcofilms.com). Check them out for all of you Digital Media Needs!! What is a Vector graphic? …and Why is it always preferred over Raster Images? Don’t wait until next week to order your Custom Race T’s and sign up for this event!! IOA Corporate 5k is a unique 3.1-mile run/walk evening event where Florida’s corporate and non-profit communities form teams and participate in workplace health, promote camaraderie, friendly competition and celebrate with co-workers. Each year there is a contest with a prize awarded to the team with the best overall event & team T-Shirts. Although we’ve come close, we’ve never had a Hittn’ Skins printed T-Shirt take home the gold for the “best team race shirt”. In the past Hard Rock has won it…(We think it’s fixed…JK) but it won’t stop us from coming up with some of the most amazing & creative designs and print quality to hit the streets. If you have already decided you are not going this year, join us next season in our quest of taking home the grand prize and winning best overall Race T-Shirts by sending in your design ideas early so we can be sure to out-do every screen printer in our area and win the prize! ​This past week Orlando Weekly Magazine approached us to be a t-shirt sponsor for Artlando 2014!! What is Artlando? It’s a concept art show hosted by O’Weekly showcasing mixed forms of art from local artists, performers & craft vendors. The title…ONE DAY. ONE FESTIVAL. ALL ART. Pretty awesome!! For the event promos…The Orlando Weekly’s creative department sent us their artwork to produce high quality promotional t-shirts for Artlando. We decided to go with a premium 60/40 ring spun cotton/poly T- Shirt printed with a super soft hand premium white plastisol. This option gives the finished product a soft, smooth and bright opaque white print. We use special techniques & additives designed to print without making the print super thick or “un-breathable”. As an extra spiffy, we added a custom inside printed tag to help enhance the branding of the event and make the shirt that much more collectable! Even in a pinch & with a shorter notice than we generally prefer, the HS team came through in a big way once again!! Screen Printing has been around since 960 AD, originating in China during the Song Dynasty. It is considered one of the most versatile ways of modern printing and can be used to apply print to textiles, paper, and glass. 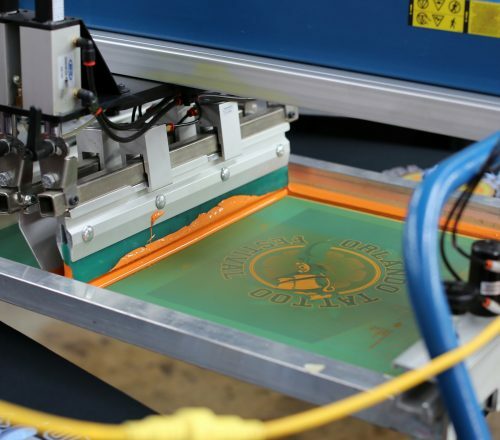 T-Shirt Screen printing, also known as silk screening or silk screen printing, is the technique of using a stencil or “screen” to print inks directly to the surface of a garment. This method is the most cost effective way to reproduce the same image on multiple piece runs. Screen Printing is an art, a science and a labor of love. Hittn’ Skins is a printing company that mainly screen prints T-Shirts. You really have to love printing t-shirts to go through the tedious and detail oriented steps repeatedly time after time and day after day to do it as a career. Our passion to create perfectly printed T shirt Graphics is what keeps us going & keeps us growing. The staff at HS keeps this notion in the forefront of each day and throughout all of our operations.